Zionist association organized in 1897 under the name of "Federation of Zionist Societies of Greater New York and Vicinity." It gradually expanded by absorbing societies outside New York, and on July 4, 1898, a convention was held in New York, the result of which was the founding of a national organization under the name of "Federation of American Zionists," incorporated by the New York state legislature (1902, ch. 102). The number of societies originally enrolled in the federation was twenty-four, comprising, approximately, a membership of 1,000. At the convention held in Boston, May, 1901, the secretary's report showed 152 enrolled societies, with a membership of 8,000. 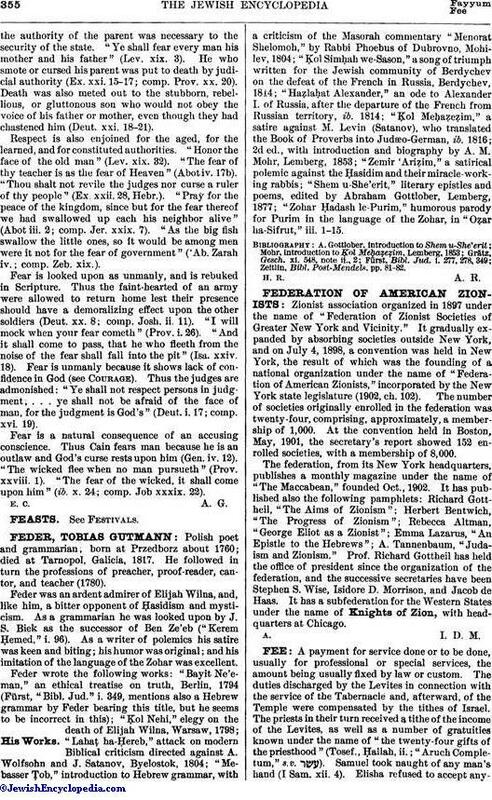 The federation, from its New York headquarters, publishes a monthly magazine under the name of "The Maccabean," founded Oct., 1902. It has published also the following pamphlets: Richard Gottheil, "The Aims of Zionism"; Herbert Bentwich, "The Progress of Zionism"; Rebecca Altman, "George Eliot as a Zionist"; Emma Lazarus, "An Epistle to the Hebrews"; A. Tannenbaum, "Judaism and Zionism." Prof. Richard Gottheil has held the office of president since the organization of the federation, and the successive secretaries have been Stephen S. Wise, Isidore D. Morrison, and Jacob de Haas. It has a subfederation for the Western States under the name of Knights of Zion, with headquarters at Chicago.